The Dynafit TLT Speed is the third binding in our Lightweight Touring Binding Shootout that we’re going to discuss. It was a brand-new offering from Dynafit for the 17/18 season, and it returns unchanged for 18/19. Dynafit has been a leader in the tech binding world for a long time, but a lot has changed since Fritz Barthel made the first “low-tech” Dynafit pin binding back in the 1980’s. A bunch of companies have since entered the tech-binding game, so does the TLT Speed still put Dynafit at the top of the lightweight touring binding category? Sam Shaheen and I both spent time on the TLT Speed. I toured on it around Colorado and we both skied it back-to-back against the other bindings in our shootout at A-Basin to get an idea of how it compares to the other options in this class. Sam Shaheen: The toe on the TLT Speed feels more solid than I expected it would, given that the baseplate is plastic (the wing arms and lower toe lever are aluminum). However, the TLT Speed’s toe piece is the heaviest in our test (tied with the Marker Alpinist), and I don’t think that bit of extra weight is a bad thing — the TLT Speed’s toe feels well constructed. The plastic base plate holds the TLT Speed’s crampon attachment and interfaces with the ski / walk lever for locking the toe out in walk mode. The TLT Speed’s toe piece also has a small metal bracket where a leash can be girth-hitched (we used a leash, rather than brakes, during our test). 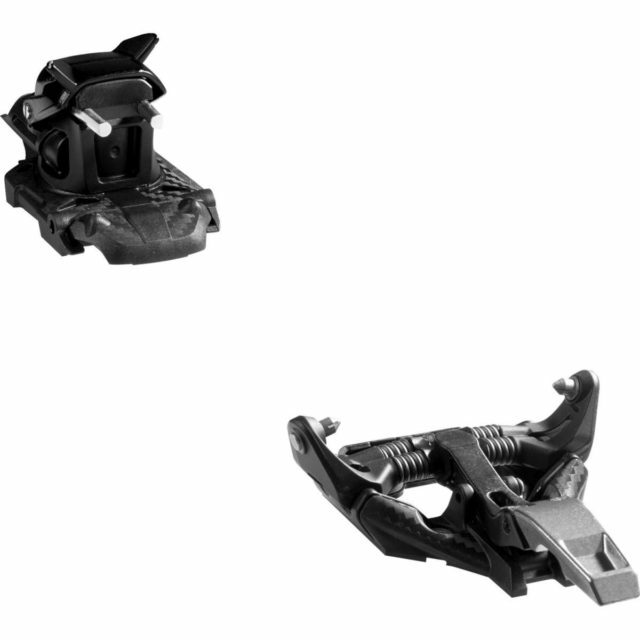 The pivot point of the toe jaws on the TLT Speed is a bit lower than both the Marker Alpinist and the ATK Raider 2.0 12 / Hagan Core 12. In theory, this gives the toe piece of the TLT Speed slightly worse leverage / holding force than the Alpinist and Raider 2.0 12 / Core 12, and this seemed to be reflected in our on-snow testing. While a variety of factors go into pre-releases, the TLT Speed was the only binding in our test that pre-released — including a pre-release from the toe. Luke: At first glance, the TLT Speed’s heel piece looks pretty different than those of the other bindings in our test. The TLT Speed’s heel has a big extension on the back where the lateral release is adjusted, and has two climbing risers that sit flush on the heel unit when not in use. But while it may look a little funky, in use the TLT Speed is actually pretty similar to the other bindings in our test. The TLT Speed’s heel uses a simple U-spring design with lateral release values that can be adjusted from 6-12. Like the other U-spring bindings in our test (Alpinist and MTN / Backland Tour), the TLT Speed’s vertical release value is dictated by its U-spring. And unlike the MTN / Backland Tour and Alpinist, Dynafit does not sell alternative U-springs for the TLT Speed. Just like many of Dynafit’s traditional heel designs, the TLT Speed doesn’t have any active length compensation and is mounted with a 5.5 mm heel gap to deal with ski flex on the downhill. The heel on the TLT Speed is unique in our shootout in that it’s not designed with a truly flat touring mode. The TLT Speed’s lowest touring mode is actually 15 mm above where the heel of the boot sits in ski mode. When the TLT Speed’s heel is rotated 180° for touring mode as Dynafit designed it to be, the end of the binding sits under the heel of the boot, lifting it off the ski more than the “flat” modes on the other bindings in this test. However, you can rotate the TLT Speed’s heel about 90° to get a flat touring mode, though this is not how the binding is designed to function. If you’re using the TLT Speed’s optional brake, leaving the heel rotated 90° won’t lock the brake down. We used the TLT Speed with leashes and have successfully been able to skin with the heel piece in the makeshift “flatter” mode. But if you’re skiing the TLT Speed with brakes, this won’t be possible without jury-rigging the brakes with a ski strap or rubber band in order to keep them off the snow. And since the TLT Speed’s heel piece is fairly long, it extends over the edges of narrower skis when rotated 90° (on the Salomon MTN Explore 95, the TLT Speed’s heel piece extends about 1 cm over the edge of the ski). So while there is a way to get a truly flat touring mode, it’s not ideal. We tested the TLT Speed without brakes, but optional brakes can be purchased separately. The brakes can be installed and removed after the TLT Speed is already mounted on a ski, and have a stated weight of 90 grams per brake. Luke Koppa: The TLT Speed is a pretty simple and enjoyable binding to tour on, though it does have a few quirks. Despite not having any sort of toe guides, I found it very easy to step into the TLT Speed. I’ve spent a lot of time in the Dynafit Radical 2.0 and Rotation 10 bindings, and the TLT Speed felt similarly easy and intuitive when it came to stepping in (and the TLT Speed doesn’t have the added complexity of those other bindings’ rotating toes). Compared to the other bindings in our shootout, I found the TLT Speed to be similarly easy to step into compared to the Raider 2.0 12 / Core 12, and noticeably easier than the Alpinist and MTN / Backland Tour. When it comes time to transition from ski mode to walk mode, you have to turn the TLT Speed’s heel by hand as the risers do not have any holes large enough to turn with a ski pole tip. Personally, I really prefer having the option to turn a binding’s heel using a ski pole since I’m notoriously inflexible (and maybe just lazy?). But if you’re used to switching your bindings by hand, the TLT Speed is nothing new. The TLT Speed’s heel does have a bit of a “point of no return” around 120° into its rotation where it snaps itself into place. This makes it easier to transition compared to the Alpinist, which basically requires you to rotate the heel piece the full 180° by hand. I know that sounds like a little nitpicky comment, but when I’m transitioning in exposed terrain, I appreciate having a binding that snaps into place a bit easier. As we noted above, the TLT Speed doesn’t technically have a truly flat touring mode. While actually skinning, the TLT Speed’s lowest touring setting does feel higher than the “flat” settings of the other bindings in our test, though I didn’t feel like the difference was really drastic. If a lot of your ski tours involve long, flat approaches, this is noteworthy and could potentially be a dealbreaker. But in a place like Colorado where we don’t have a ton of flat approaches, I don’t have a problem with the TLT Speed’s lowest touring setting. And as you saw in our description of the TLT Speed’s heel, you can get a truly flat touring mode by only rotating the TLT Speed’s heel about 90° so that the heel piece is perpendicular to the ski. But for all the reasons mentioned above (e.g., this won’t work with brakes and the heel piece extends over skis narrower than ~105mm-underfoot), this “solution” isn’t ideal. The TLT Speed’s heel risers are pretty easy to flip with a ski pole basket or grip, though not quite as easy as the shootout-leading Raider 2.0 12 / Core 12. The TLT Speed’s highest riser is 41 mm above where the heel of the boot sits in ski mode, which is a bit lower than I’d prefer for the highest riser setting. But if you’re a wiser person than I and actually set smarter, lower-angle skintracks, I doubt it’ll be an issue. Just don’t expect to be able skin straight up steep slopes on the TLT Speed. If you want a whole bunch of riser options — and significantly higher options — then the Raider 2.0 12 / Core 12 is the best choice in our shootout. As Sam noted in the Alpinist and Raider 2.0 12 / Core 12 reviews, all of these lightweight bindings require you to kick a bit harder on your kick turns since their lighter heel pieces don’t automatically drop the tails of your skis like some heavier touring bindings do. During my time touring on the TLT Speed, it didn’t take me long at all to adjust my kick-turning technique to address this. First, the downhill performance of each binding is surprisingly similar. If we weren’t skiing them back-to-back, we doubt we would be able to discern many differences in performance. Second (and perhaps even more surprising), is how hard we were able to ski on these bindings without breaking anything — including ourselves. 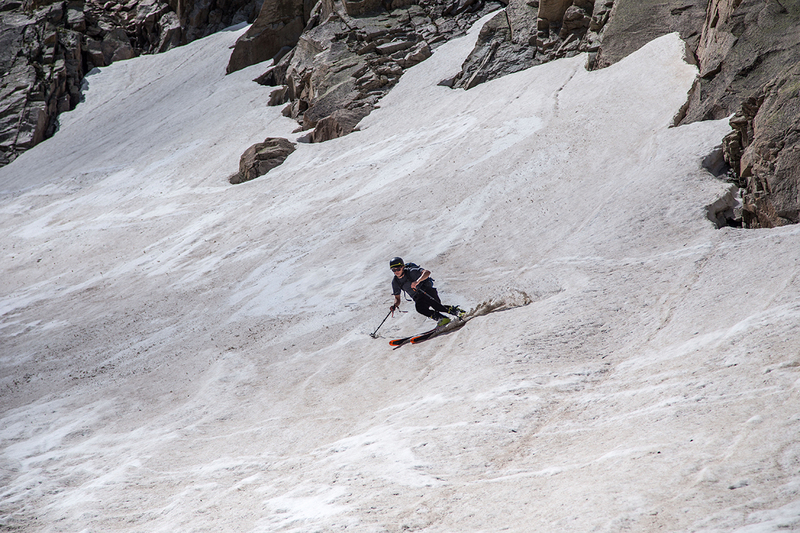 Much of our downhill-performance testing was done inbounds on firm or soft, chopped-up snow and at very high speeds. All of the bindings in the test performed surprisingly well (though the real standout in our shootout was easily the ski — the Salomon MTN Explore 95 that we had all the bindings mounted on is just soooo good). Sam (5’10”, 140 lbs): The TLT Speed has the least distinct downhill feel of all of the bindings in our shootout — it falls in the middle of the pack in nearly all of our downhill performance metrics. In terms of smoothness or the amount of energy / feedback transmitted from the snow through to the boot, the TLT Speed ranked just below the shootout-leading Alpinist. Although the TLT Speed doesn’t have any elastic travel, it still provides a fairly smooth ride given how light and minimal its construction is. I think this could be due to the partially plastic construction damping some high-frequency vibrations. But the point is, the TLT Speed feels slightly less harsh compared to the Raider 2.0 12 / Core 12 and MTN / Backland Tour. When it comes to power transfer, I think the TLT Speed falls into the 3rd spot — just above the MTN / Backland Tour and below the Alpinist and Raider 2.0 12 / Core 12. Both the TLT Speed and MTN / Backland Tour feel precise in the toe, but the heel on the TLT Speed feels like it has a touch better connection to the ski than the MTN / Backland Tour. Again, this is pretty subtle. Both the Raider 2.0 / Core and Alpinist do a better job of transferring power to the ski than the TLT Speed. When it comes to how much energy / pop we felt we got out of the MTN Explore 95 when it was mounted with different bindings, the TLT Speed sits at the bottom of the pack. There is a noticeable difference between the most “energetic” binding (the Raider 2.0 / Core) and the TLT Speed in terms of how lively the MTN Explore 95 felt when being skied hard. The most noteworthy thing about my time on the TLT Speed is that it was the only binding in the test where I experienced a pre-release. (I had two unwanted releases in the TLT Speed, while Luke did not have any.) One pre-release occurred when I got knocked forward and off-balance during a tight turn in a banked slalom course, and the TLT Speed’s heel released. (The toe of my boot stayed in.) The other pre-release happened at the toe after jumping off a small side-hit and landing on firm snow. Sam Shaheen on the Dynafit TLT Speed. To be crystal clear: there are a lot of different factors that contribute to a binding releasing unexpectedly (e.g., snow conditions, impact angle, boots used, etc.). But since none of the other bindings pre-released during our tests — and we were skiing hard and fast on all the bindings over several days — we felt that this experience was worth noting. 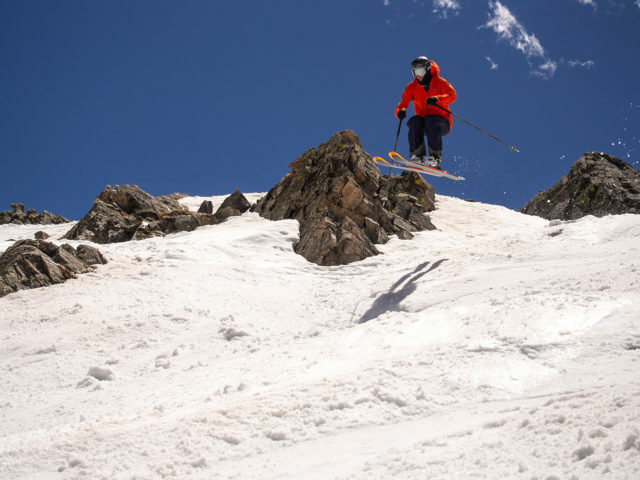 And we’d also say that if you tend to ski more conservatively on your AT gear, then we doubt there will be as much of a difference between the bindings in our group in terms of release and retention. Again, we were skiing these bindings nearly as hard as we were on alpine bindings, and that really isn’t what they’re designed for. Luke Koppa (5’8”, 155 lbs): The TLT Speed has a unique combination of downhill performance characteristics that make it a bit tricky to really identify where it fits in among the other bindings in our test. As Sam noted, the TLT Speed actually feels a bit smoother than the Raider 2.0 12 / Core 12 and MTN / Backland Tour. And since I dislike the harsh feeling that many minimal, lightweight pin bindings impart, I personally liked this aspect of the TLT Speed. But on the other hand, the TLT Speed does not feel like it provides as much / has the same power transfer as the Raider 2.0 / Core and Alpinist. The TLT Speed’s heel just feels a bit more vague than those bindings, and less confidence-inspiring overall. Finally, there are Sam’s pre-release experiences. After a few days skiing in the TLT Speed, I haven’t had it release when I didn’t want it to. But the TLT Speed’s large heel gap and lack of active length compensation makes me feel less inclined to ski as aggressively on the TLT Speed as I would on the Alpinist or Raider 2.0 / Core. 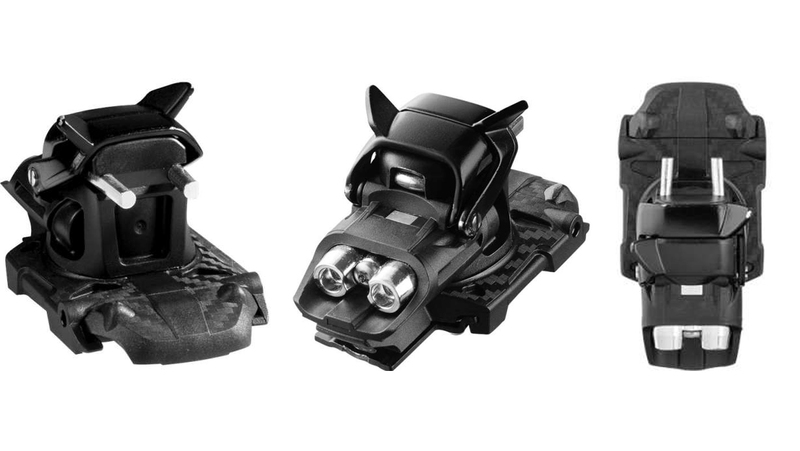 And after saying all that, I think it’s very important to reiterate that all of the bindings in our shootout are very light, and are designed to prioritize uphill efficiency over aggressive, freeride-oriented downhill performance. While the Raider 2.0 / Core and Alpinist are surprisingly good on the downhill, if you’re looking for a touring binding to ski really hard and fast on, there are a ton of really good (though heavier) options on the market — e.g., Marker Kingpin, Fritschi Tecton, and Salomon / Atomic Shift. Sam: U-spring bindings like the TLT Speed have been shown to prematurely wear out the pin inserts on touring boots and change the release characteristics over time (in some cases, release characteristics can change dramatically). This is in contrast to other (often heavier) tech bindings that have separate heel pins which move much more easily around the boot heel insert when stepping into the binding. Every time you step into a U-spring binding, the spring itself needs to bend outward to get around the boot heel insert, which is more abrasive than bindings with independent heel pins (e.g., Dynafit Rotation 10, G3 Ion, Fritschi Vipec Evo). 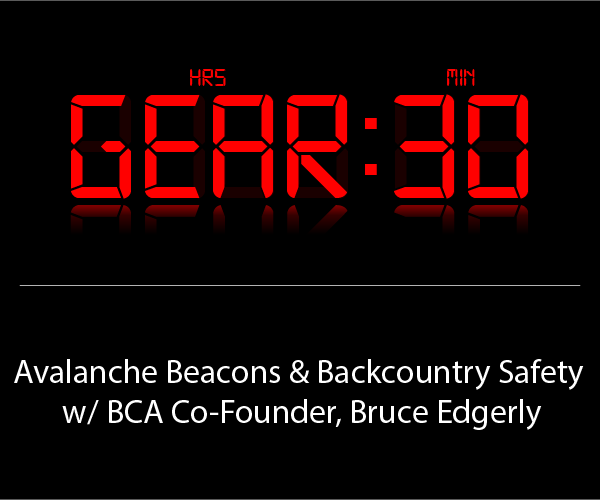 For more on the potential safety issues with U-spring bindings, check out our podcast with some of G3’s engineers where they discuss this topic around the 41:00 mark. 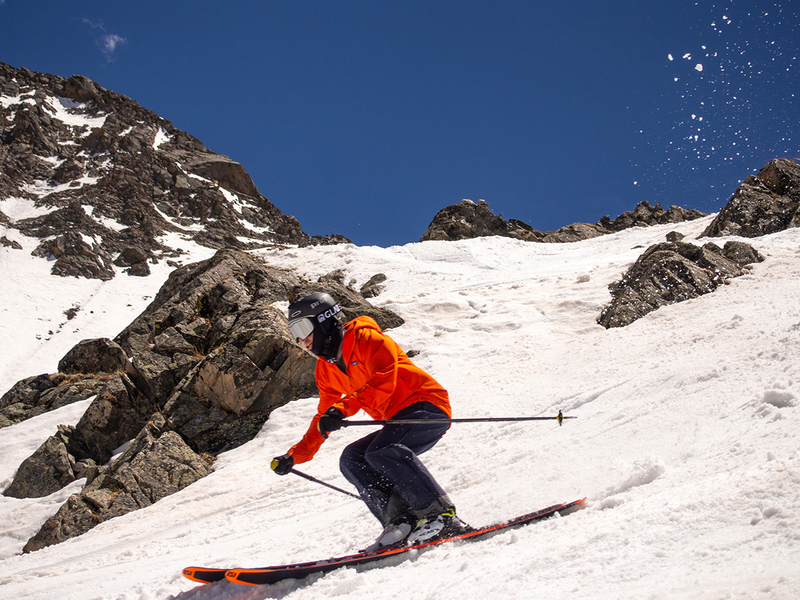 U-spring bindings also have much less adjustability when it comes to vertical release, since the spring itself dictates the vertical release value. The Alpinist has adjustable lateral release and its vertical release is determined by the U-spring. However, it also has active length compensation to help with release consistency and is the only binding in our shootout that does not require a heel gap. The Raider 2.0 / Core has independently adjustable vertical and lateral release at the heel and features independent heel pins (i.e., not a U-spring). It also has active length compensation, but still requires a heel gap. The TLT Speed has fixed vertical release (U-spring-dependent), adjustable lateral release, and no active length compensation. The MTN / Backland Tour has essentially no adjustment except for swapping the U-spring, and has no active length compensation. It is difficult to figure out how much each of these bindings’ features contributes to safety without a large-scale study. But it is clear that the TLT Speed has fewer safety-oriented features than the Alpinist or the Raider 2.0 / Core. If I had to choose a binding based on safety alone, I’d take the Alpinist or Raider 2.0 / Core over the TLT Speed. Sam: No durability concerns have come up in our testing of the TLT Speed so far. We’ll be getting more time on this binding next season and will be sure to keep this updated if anything changes. Luke: I think it’s easiest to start with who shouldn’t buy the TLT Speed. And that would probably be people that (1) want class-leading downhill performance in their lightweight touring binding, (2) place the highest priority on safety features, and / or (3) go on a lot of tours with long, flat approaches. But if you just need a basic, lightweight touring binding and aren’t pushing the limits of your gear (or yourself) in the backcountry, the TLT Speed is a decent all-around option. I think it’d be especially appealing to people that have been using Dynafit’s more minimal touring bindings for years and are looking to upgrade — without having to adapt to a new transition routine. While the Dynafit TLT Speed didn’t blow us away in any particular category, it also didn’t fall really short in any category, either. It’s simple, it’s pretty easy to use, it’s very easy to step into, and it offers decent downhill performance. The lack of a flat touring option may turn off some people, and the Alpinist and Raider 2.0 12 / Core 12 are better options for those that prioritize downhill performance and safety. But if you’re looking for a simple, lightweight touring binding for mellow tours, the Dynafit TLT Speed could make sense. Good comparison-contrast review. I just started backcountry skiing and bought the Dynafit TLT Speedfit for my first setup. I probably don’t ski them as aggressively as the authors. On alpine gear I’ll ski anything in-bounds. My backcountry experience so far has been on relatively new snow so I haven’t seen a lot of ski flex requiring active length compensation. Maybe when spring rolls around. I am having the same issue, looking at the new marker alpinist U-spring. Ordered one and going to try it out, I’ll let you know.